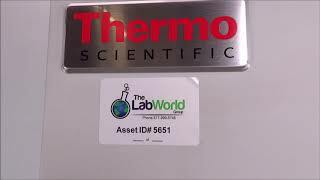 The Thermo Revco -20 Lab Freezer UGL2320D19 provides simple operation with automated tracking to protect your samples. This lab freezer has a capacity of 23 cu ft(659L), with 4 adjustable, coated shelves and 2-inch-thick foamed in place insulation for excellent uniformity, while the integrated chart recorder automatically records temperature for records. The lockable, solid door helps to reduce the effect of ambient temperature fluctuations, while the forced air circulation helps maintain uniformity and rapid recovery after openings. The Thermo Revco -20 Lab Freezer UGL2320D19 has a bright easy to read display with touch pad controls allowing users to change their set points. Temperatures and parameters for this microprocessor-controlled freezer can be locked in with a key to prevent accidental tampering. The controller of this -20°C Lab Freezer has a battery back up to preserve settings in the event of a power failure. This Thermo Revco -20°C Freezer Model ULG2320D19 has been fully inspected and is performing without issue. All of our lab equipment comes backed with our standard warranty. Should you have any questions, please don't hesitate to contact us.